1. The thing I remember most about Rod was how he was able to get 1000’s of people to sign up to become bone marrow donors during his daughters fight with Leukemia. They were unable to find a match for her but I expect that of the 1000’s of donors who signed up for her, they have probably saved a few lives if he got a good number of black donors. From what I understand they don’t need any European stock donors as I understand they have a 100% chance of finding a match if your European, but your chances are hard if you are Asian or Black as not enough people from these races have signed up. That is what I’ve been told by people who administer these program, so I can’t say if that is true or not. Not much. The only day game the Twinkies played in Balty in ’78 was May 7th. They won 15-9. Carew came to bat six times. He batted in each of the first three innings, walking, hitting a sac fly, and singling. He’d later walk again, and single again. His only unproductive at bat was a strike out in the eighth. Judging by the lack of wear and tear on the uniform in a game with so much early action, and by the fact that at least in my mind, I picture baseball card photographers shooting as soon as they can in a game, usually leading to early-game shots, I’d guess this was one of the early, successful at bats. (The first two were against Palmer, the third against ill-fated future Red Sox manager Joe Kerrigan.) The catcher is definitely Dempsey, though. Oh, and I have discovered that Topps definitely would at times use a picture from two years before instead of one. But Carew didn’t play in any Min @ Bal day games in ’77, so I think it’s safe to say this 1979 card’s pic is from 5/7/78. But I could be wrong. 4. 3 : Excellent sleuthing! My grammatically clumsy bit of rhetorical hyperbole probably deserved to be punctured, rather than supported, by the facts, but I’m happy that it wasn’t. I don’t deserve such a turn of events, but Carew certainly does. 5. I’m a bit younger than you Josh, and Carew was just finishing his career when I became interested in baseball and, as a result, started collecting cards. But your sentiments about Carew are very similar to my own memories of Tony Gwynn. For kids a generation younger than me, it’s probably Ichiro in that role. But who was the guy before Carew? 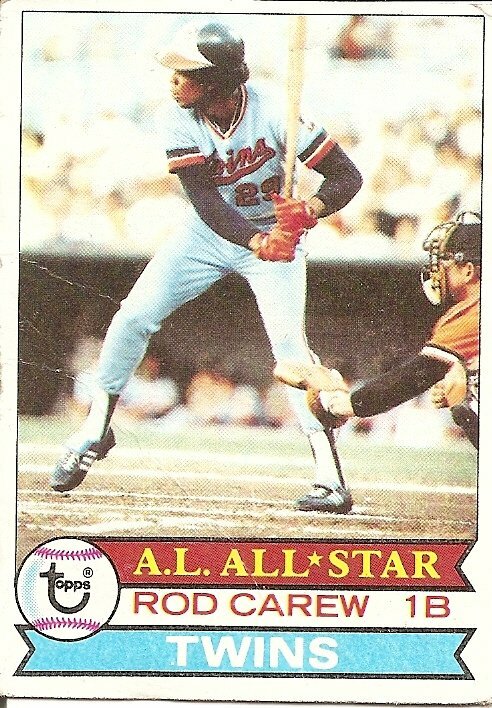 Was there an immensely watchable contact hitter, a star of that caliber, preceding Rod Carew? At least within living memory…cause Wee Willie Keeler was probably a blast to watch but I don’t think he can be compared to Carew, Gwynn, and Ichiro. 6. 5 : I always got the sense, from reading about it, that a couple Washington Senators, Buddy Myer and Cecil Travis, were (unsung) Carew types. Must be the franchise. I guess Tony Oliva was a bit like Carew with more power when he was in his too-short prime. 7. 0 Never mind if the sentence about the battery is a bit awkward. “Coiled yet serene praying mantis stance” makes it all worthwhile. 8. Harvey Kuenn, courtesy Baseball-Reference.com. 9. It seemed like Carew always had more All-Star votes than anybody else in baseball, even though he had to compete with Eddie Murray and Cecil Cooper for votes. 9 : I also remember Carew doing well with the voters. I think his batting average had him rated really high in people’s minds while he was playing, plus the fact that he was just really cool. Rod Carew! Some stars of that time sweated and grunted (Pete Rose), others bellowed and preened (Reggie), and others smiled and campaigned (Steve Garvey). But Rod Carew, man, he just hit. Now I wonder if he’s actually become a little underrated. 11. Richie Ashburn is a decent precursor to Carew et al. How am I supposed to hit when I’m more hole than swing? Josh, sometimes you’re just too damn tough on yourself, although that’s probably a part of what makes your work so great. Thanks. 13. I got to this story a bit late. Loved the memory of the sunday paper batting averages. It was the best part of the paper and something we are spoiled about now, with the instant access of the net. 2 memories. Carew swallowed his chaw in one all-star game and looked about as ill as man can get. Also, I loved watching him bunt more than any other player, as he would hold the bat like he was swinging away and control the ball like his stick was a magic wand. 14. I’m amazed at how Rod Carew was at the top of the list of baseball greats when he played, now he is largely forgotten. Josh’s recollections about the emotion of seeing his name at the top of the list in the papers every single Sunday certainly rings true with my experience as well. I’ve often wondered why Carew is ignored now? I thought it was because he didn’t walk enough and didn’t hit for power, but recently I looked him up on B-R and he walked quite a bit more than I expected. I thought maybe playing for the Twins hid him a bit, but he played for some good Twins teams at the start of career and some good Angels teams at the end, and when he played, he got tons of All Star votes. I guess there were just too many good first basemen with power for him to stand out. Read about your blog in the Times, and am fascinated. I went straight to my big box of cards from the same era and started pawing through them. Topps must not have printed many of Carew’s card this year. I had multiples of all the other all-star cards, but it took all summer (buying 5 packs every week, all that my 8-year-old allowance could afford) to get this Carew card. I was in my mother’s upper west side manhattan kitchen when I opened the pack and saw it, and started jumping up and down so much that the downstairs neighbor came up to complain. Thanks for the great posts. Keep it up. You might be on to something. As I mentioned in the post, I didn’t get this card as a kid and was only able to include it out of the kindness of reader Brent Topping. Damn, that’s poetry. Great work…I’m totally stealing that. I’m the Brent Topping who sent Josh the card. Interesting that it’s being suggested that there was a shortage of these. If so, I’m all the more happy to have sent it to Josh. It’s doing much more now that it did sitting in my big box of 1980 Topps cards – the only set I own any significant amount of. Josh – Hope your book has sold well, and good luck with the paperback! Awesome post too at #3 figuring out which day this picture was likely taken. Rod Carew’s two strike, time-to-just-slap-whatever-is-close-over-top-of-the-second-baseman-swing was probably the most imitated thing on the whiffle / baseball fields of my youth. Everybody had one they would try… leaning out a little more over the plate, choking up ever so slightly, trying to pull off that almost nonchalant snap of the wrists… Great player to watch growing up, even if I didn’t get to see him play during his true salad days.